On 25th July actress Cara Readle, who is one of our fabulous ambassadors, drew the winning tickets for our summer raffle. 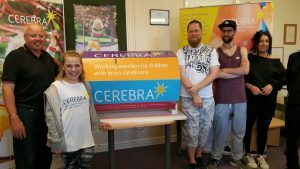 Cara is currently in training to complete a duathlon challenge for us so Cerebra staff got into the spirit of the occasion and dressed up in their best workout clothes! We hold two raffle draws every year, a summer and a winter raffle. You can find out more information about our raffles including how to purchase tickets and past winners here.